STEALING BANKSY? is the 2014 project exploring the social, legal and moral issues surrounding the sale of street art. Taking place from April 24th to 27th in the heart of London, the exhibition showcases the most expensive collection of Banksy artworks ever assembled under one roof and is the culmination of a 12 month project to uncover, salvage and lovingly restore these pieces that have shaped the capital we live in. 20 artworks by renowned graffiti artist Banksy, including 7 of his most important street pieces, will appear in the exhibition headlined by arguably his most famous piece, ‘No Ball Games’. STEALING BANKSY? supports a number of charities. Each piece of artwork has been assigned an individual charity with donations made from their sale, as an example 100% of the sale profits from No Ball Games will be donated to the charity Step By Step which supports the community from where the piece originated. Other charities include Step by Step, Tree of Hope supporting Lyra, Rowan Park school in Litherland, Asser Bishvil Foundation, Kunstmuseum Basel Stiftung. 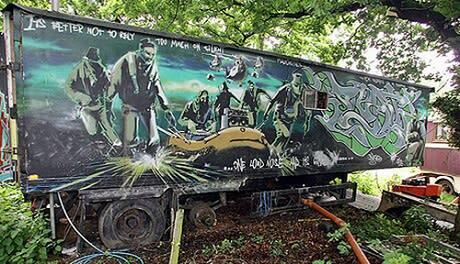 Silent Majority: One of his earliest pieces, Silent Majority was painted onto the outside of an 'Overlander' semi-trailer. Created at Glastonbury festival in 1998 in exchange for a pair of festival tickets, this work took three days to complete and measures 2.4 metres by 9.95 metres.